Had an absolutely fantastic day, it was well received by all the guys, definitely recommend it, great value for money and the museum its great. Thank you, your staff are brilliant!! Had the most fantastic day! We came for a stag do, did the Tank Paintball Battles, as well as air rifle shooting and archery. The instructors were clear, friendly, and enthusiastic, and it was a thrilling experience to drive the tanks and learn how to load, aim, and fire the gun. The staff were extremely helpful throughout the booking process, responding quickly and thoroughly to all my questions. Everyone had an amazing time, I highly recommend Armourgeddon for a great day out! Fantastic day out and all 3 of us thoroughly enjoyed the experience. Fantastic experience for a special birthday treat. Thoroughly enjoyed by all. The staff were attentive and friendly and the photos were of good quality to remember our day. the spectators enjoyed the museum too. Would highly recommend. Fantastic day out. Great fun, well organised. Hopefully be back to give the tank paint balling ago. Great experiance trecking around in an FV432 with great staff and a good little collection in the museum with WW2 and Cold War era tech. Probably the best Fathers day present I have ever had! Connor was a great instructor, the rest of the staff were very friendly and professional. Everyone gets a go at all the aspects of the battle from driving, loading and firing. The museum itself has some real gems if you're into tanks like I am, well worth a look. The only criticism I have is the photos are £20 and supplied on a disk. I would of paid to have them emailed to me (cheaper?) as I don't have the facility to use a disk anymore. But all in all a great experience and I can fully recommend it! This was something I always fancies and never got around to doing. I enjoyed every bit of it. Friendly welcoming staff. My instructor was Luke, who was very knowledgable and made the whole experience relaxed, yet really good fun. No doubt I’ll be back in the future. We took the Dads and Lads Experience voucher and we were not disappointed. Don’t let the title fool you! My wife and I had an amazing day, regardless of the rotten weather (in fact, it made the experience much more realistic!). The photos you could buy afterwards were an excellent souvenir. Would definitely do this again. 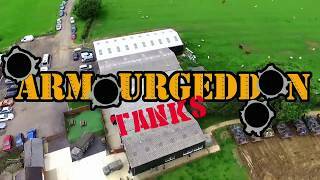 It was a excellent experience, from start to finish our instructor Chris was brilliant and allowed my 8 year son to have verbal diarrhoea with excitement while still keeping the day moving and excitement of driving and firing the tank high. It was very good day and highly recommend it. An enjoyable two or three hours overall. The title is misleading because it's not really a tank, but I suppose the experience is similar. Lee, my instructor, was excellent, friendly and knowledgeable. The museum is interesting and worth looking around. Good value fun, but I would recommend doing it in nice weather rather than chilly November. Accompanied by my Daughter and Son, as well as my Grandson, we took the Tank experience on 3.11.18.Our Armourgeddon rep. was Cameron.I have to admit I was rather hesitant about the day as my Grandson is only nine years old...BUT..i had no worries at all once Cameron took over. The guy was simply brilliant. Without exaggeration he made our day. He was so patient, and encouraged my Grandson who was understandably nervous about the whole experience and helped him throughout the entire two hours we were engaged on the 432. He was VERY professional while at the same time putting us all at ease and ensuring we had a great time. My Grandson loved every second of it all. In this age of take your money and goodbye it was a pleasure to meet someone so committed in helping us all to have a great experience. Many thanks Armourgeddon. We will come back in the new year and do it again. As an ex Tanky myself from a Family of ex Soldiers I appreciated his efforts on behalf of my Family members. From a personal point of view i really enjoyed talking to the owner of the Mark 9 Chieftain of which I served on as a gunner in the Blues and Royals in Germany in the seventies. It made my day. Many thanks for a special Family occasion. I would give six stars if i could. Thank you. Absolutely brilliant day, great fun driving, even better fun shooting at the other tank in the battle, highly recommend it to all. Our instructor Josh was excellent and made it great fun for all of us. Booked tank driving experience.Clothes were provided, so no need to worry. Great experience. I ride the tank approx 40 min, intresting tank museum around. As it was not cheap experience could be nice if the photos will be a little bit cheaper or just free as is not a lot of diference between them. If you only keep company to someone you will be charge 6 pound for visit. We spent a morning at Amegeddon for my fathers birthday. He seemed to really enjoy himself and was only sorry that it was over so quickly. My husband and I thoroughly enjoyed this experience and wish it could have lasted longer, Alex our instructor was informative and encouraging and also gave us ideas of where to visit afterwards as we came from Suffolk,( Foxton Locks were beautiful ), the museum was well worth a visit with lots of tanks etc to see and read about. Would certainly do it again but we did get a special deal. Going for the paint balling tank drive next time. You can also get hot drinks and snacks with clean loo’s too, all in all a pleasant morning. Thanks. Weather rather wet but a good day out. Thoroughly enjoyed by all. Instructor was very informative.